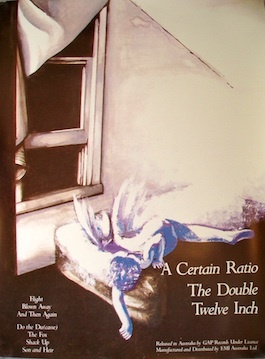 Factory Records: FACDP 1004 A CERTAIN RATIO The Double 12"
Notes: Reversed labelling on record 2. The prefix FACDP stands for Factory Double Pack. There wasn't a [UK or EMI] code for a double 12" so GAP invented one. Also promo poster, size 18"x24" with adapted design by ANDREW PENHALLOW.